For those with broken TRS-80’s who have been looking for people who might be able to repair them, this page is a listing of people who have advised that they are able to do repairs. I have not met, used, spoken with, vetted, etc., anyone on this page, so you must make your own decision as to whether you wish to hire the person and send off your TRS-80. I cannot stress strongly enough that I take no responsibility. I am merely passing on the identities of people who say they can do the repairs. Manager and Senior Technician for Radio Shack Computer Repair Depot 05-0723 in Hamilton. Can handle all TRS-80 computers including pocket. Any hardware which has sat around unused for a few decades may have developed problems in the interim. Solder joints may have detached, belts broken, disk drive heads frozen in position, etc. The following are some questions which had been asked in the past and the answers given. While YMMV, these may be of use. Of course, ANYTHING AND EVERYTHING YOU DO IS AT YOUR OWN RISK, EVEN IF YOU ARE FOLLOWING THE SUGGESTIONS BELOW. Is it ok to use sewing machine oil to grease the rails on a floppy drive? WAV’s played on my PC into the LINE IN plug from a cassette cable don’t seem to work. First, check that the TRS-80 will load a normal cassette the traditional way with a CTR-80A or a CCR-81. If it won’t load from a regular tape deck it will never load from a PC. If it does load from the tape, then we know the cassette load circuit on the TRS-80 is working. Then it’s a case of getting the volume and tone correct from the PC headphone output jack to what the TRS-80 is expecting to “hear”. This can take some time and most people struggle with it. One site visitor reported that his issue went away when he found bad soldering near the LM3900 (Z4) chip. One of the 7 video memory chips is bad. I bought an Expansion Interface from eBay, but I still see my RAM at 15570. First, test every power supply on the Model I keyboard alone. If a power supply doesn’t power up the Model I, then you have a bad power supply. If both power supplies work, then hook up the Expansion Interface, turn it on, and when turning it off, listen for a second click (not the power switch) that occurs 0.25 seconds after you power down. That is the cassette relay. If you don’t hear a click, the Expansion Interface isn’t powering up. Ian Mavric prepared a video for the click test here. If either the Model I keyboard or the Expansion Interface has a DIN plug hanging out of the Expansion Interface port, then they BOTH need that. Click here for a picture. If the Expansion Interface has no DIN plug hanging out, but has some twisted wires on the SOLDER side of the Expansion Interface, then it needs a buffered cable. If the Expansion Interface has no DIN plug hanging out, and has no twisted wires on the SOLDER side of the Expansion Interface, then it needs a regular (straight) cable. This is likely a memory error. Substitute a known good set of ram chips and see if that fixes it. Model III has nothing on the screen. The brightness does show raster lines, but that’s it. Powering it on with a RESET+BREAK hits does access drive 0, but nothing shows on the screen. The brightness/contrast controls were checked with a meter, they are good and have a full range of resistances. Power is -12, +12 and +5. Initially sounds like the video output on the motherboard. A first step might be to start with a TRSDOS 1.3 disk and try to boot that, if the Drive 0 LED changes to Drive 1 LED for a moment then back to Drive 0 LED a few moments later thats a good sign that the rest of the computer is OK and the video output needs to be attended to. If you have another Model III or 4, try the computer lid from another Model III or 4 and make sure its not the video board (and if it’s the video board they are easy enough to obtain and replace). I am about to turn on a M3/M4 for the first time – is there anything I should do re the drives? open and close the door; lubricate if needed. Make sure the head moves back and forth with little resistance; lubricate the rails if needed. Check that the drive belt is not too lose or missing; replace if needed. Inspect the drive head; clean with rubbing alcohol and cotton swabs if needed. Check the felt pad on single sided drives; if missing replace it. Clean the solder covered edge connector with a pink pearl eraser. If all is well, hook it up and try to format; if it fails check RPM (should be 298). If still cant read, perhaps the logic board is bad or the disk is out of alignment. If the drives are disconnected from the controller board, but everything else was working, would it still say CASS? Bad FDC or interconnect cable between the motherboard and FDC. Try removing both disk drives, cleaning their edge connectors and trying to boot from both drives, one after the other. M3 boots but crashes when running a BASIC program or a self booting game. Bad memory. If PRINT MEM produces a number much different than 48082, it is bad RAM. The picture (called the raster) can be fine and normal, just turn the brightness down until it goes away. Then, turn the contrast up to full and insert a floppy disk but don’t close the door. It should state “Diskette?” on the screen and the contrast can be adjusted for the best clarity on the screen. A few minutes of turning it on, one of the RF started to smoke. You can just remove the capacitor and the system will still work but it won’t be FCC compliant. That doesn’t mean you SHOULD do this. Just go to an electronics shop and ask for two 0.01uF MKT 250V mains filter caps X or X2 rating, and one 0.1uF MKT mains filter caps X or X2 rating. My keyboard does not work … oh wait, it is slowly coming back to life. It now responds to Clear, the left and right arrows, the number 8 on the keypad, q, i, and c. However, I have to hold them down for a second before they do anything. You need to examine the keyboard. If it has 4 lugs per key then you can remove individual keyswitches, disassemble them and clean then, which in most instances will restore them to functionality. One of the videos shows how to do this. On keyboards with the two lug switches they can also be removed and disassembled but they are much trickier and fiddly compared to the 4-lug switches. Pascal shows on his site how to fix these key switches however when we find 2-lug keyboards with failed keys we just unsolder them and replace them with known good ones. Question: Can internal Texas Instruments disk drives be swapped between drive 0 and drive 1? Answer: Yes as TI Drives in a M3/M4 have no jumpers; drive selection is by cable, and because the internal cable is so short, drive 0 has no terminating resistor. Issue: M3 has a screen full of random characters. Disk spins on power-up but won’t do disk operations. Possible Cause: Power supply, RAM, CPU. CAREFULLY check the power supply to ensure it is giving proper voltages. If yes, then remove the bottom row of ram (=48K) and see if the problem goes away. If not, remove the middle row also (=32K) and see if the problem goes away. If not, remove the top row of RAM (=16K) and fill it other chips you removed, and see if its ok. If at any point it gets better, you have narrowed down which chips are bad. If permuting and combining RAM doesn’t help, it may be the CPU. Issue: M4P runs M3 software perfectly and won’t run M4 software. Possible Cause: On a non-gate-array M4P, the C210 adjustable trimmer cap may be out of sync. To get at the trimmer cap, the mainboard needs to be folded down, but when its folded down you can’t plug the disk drives in (cable not long enough)! So, the way to adjust it is have a known good TRSDOS 6 disk in drive 0 and alternate between reset button and adjusting the trimmer until the disk boots. Initially it will be fuzzy on the screen and adjusting it further will sharpen it up. Further than that it will go fuzzy again, so find the sweet spot and you are done. Possible Cause: On a gate-array M4P, check to see if one of the gate array chips has stopped working or has become loose..
Issue: Non-gate Array model 4 won’t boot consistently, tossing out a variety of errors. If Drive 0 -or- Drive 1 is used, same issue. Possible Cause: Non-gate M4 has a separate FDC board. If getting the exact same problems on both drives then look closely at the FDC board, and try and procure a good used one. There are two types and neither are more or less reliable than the other. The early analogue one from the Model III and early Model 4 has potentiometers which need to be properly calibrated. The later digital board in theory is better but we have seen failed FDC chips, PLL chips etc. 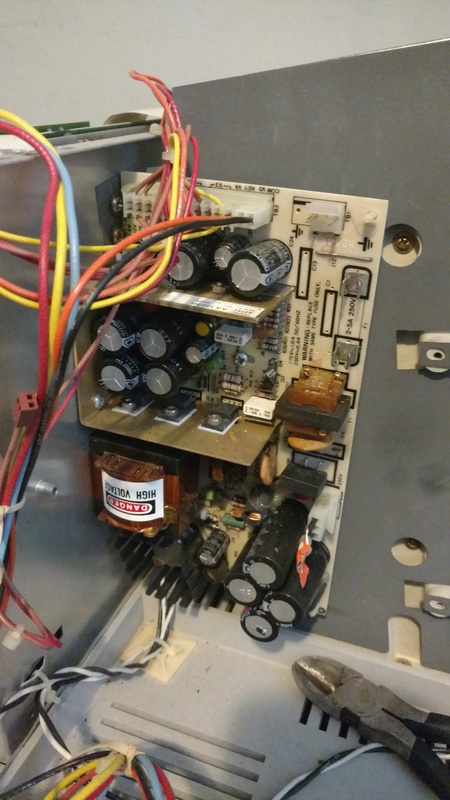 Issue: I have a non-gate array model 4 and I want to change out every capacitor. Answer: We certainly do not recommend doing this. However, here is a spreadsheet supplied by Christopher Eddy of the capacitors. Issue: Where do I find a new CRT tube? Issue: What are the significant differences between the 26-1059 student diskless version student network 4 model 4 and the 26-1069 model 4 (besides the lack of disks)? Answer: The student workstation has 64K Ram and different Roms so it will attempt to boot from the network via the serial port. Other than that it’s a pretty normal diskless Model 4. .
Issue: If I have a 26-1059 student diskless version student network 4 model 4 that I have actually upgraded to run with disks, does the ROM need to change? Answer: The network boot ROM should still run as a disk system so there is no real need for a change. If you feel you MUST change the ROM, you can program a FreHD auto-boot EPROM which will get it working (and all will be ready if he wants to use a FreHD in the future). Ian Mavric does sell ROMs but the cost of shipping from Australia will GREATLY exceed the costs of the ROMs..
Issue: How do you upgrade a diskless Model III or Model 4 to work with disk drives? Issue: Non-Gate Array Model 4 gives a scrambled screen when booting TRSDOS v6. Answer: If the motherboard has a variable capacitor up near the FDC cable connector, give it a wiggle of a couple of degrees either way. After booting TRSDOS 6 and the screen should sync up. The reason the variable cap effects the “later” DOSses is the fact that M4 DOSses run in 80 column mode and Model III DOSses use the 64×16 mode of the Model III. 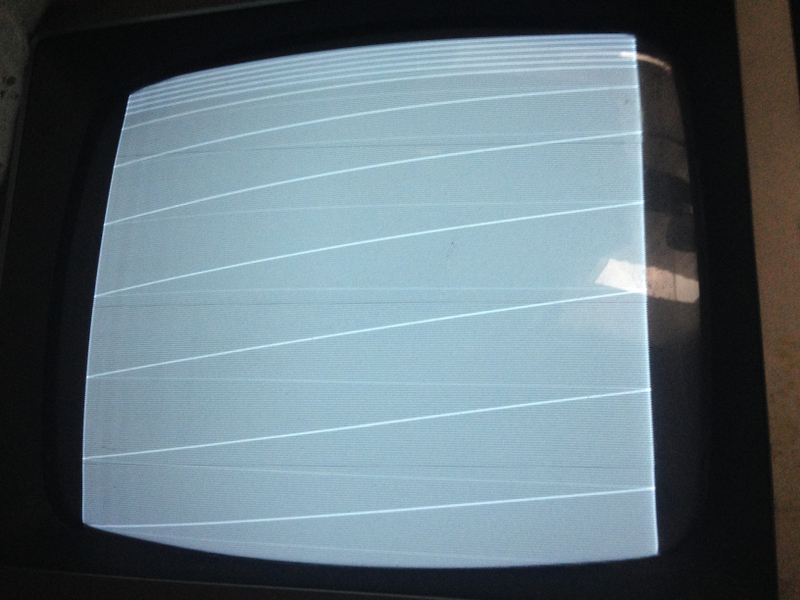 When a Model 4 DOS loads, it switches the video to 80×24 mode. The variable cap adjusts the horizontal sync of 80 column mode. Issue: Model 4D screen shows letters duplicated and then other letters missing. Typing a single letter on the keyboard (any letter) displays it twice then the next keystroke show only a flashing cursor next to the original set of letters. In other words, every odd character shows twice, and every even character is ignored. Answer: Its a motherboard problem. It could be one or two of the gate array chips, the CRT controller, and/or the video memory chip. Can’t definitively be determined without actual examination of the motherboard. Note: Some of the chips are very hard to source (gate array chips for instance, are custom chips made by RS and only used in the Model 4). Question: My Model 4P just let off a pop and a puff of smoke. I am pretty handy with replacing electrolytic capacitors. Anything I should think about? Answer: Yes, 4P has the same power supply as the M4, so suffers the same filter cap smoke-out issue. The 4P is even easier than the M4 to fix because after the outer case has been removed, the power supply is mounted to a metal panel directly above the CRT – easy access without the possibility of breaking the CRT neck like on a M3 or 4. If the power supply is Astec then C1, C2 and C13 need to be replaced. If the power supply is Tandy, then C32 and C33 need to be replaced. It is EXTREMELY rare for any caps on the 4P motherboard to need replacement, so don’t ‘t change anything on the motherboard unless there is an obvious fault. Question: Can a DW-2 printer be hooked to a PC? Answer: Yes, but there may be issues with line feeds/carriage returns not being processed properly. Ian Mavric, who is also the Australia source for TRS-80 disk requests and who repairs TRS-80s, has been making YouTube videos to assist in certain repairs.. Does ANYONE do Model II’s?? I need the legal program as well. How does one hook a 5 1/4 inch disk to a model II? I have a trs dos program on 8 inch disks….. I recently purchased a TRS-80 Model 4 128k dual drive system from eBay that claimed to work. It did boot up off the main floppy and I was able to play with the machine for about 20 minutes. The TRSDOS 6 disk I had did give me an error when I tried to load BASIC. I decided to put in another floppy and boot the system with LDOS. I put the disk in the drive – hit the orange recent button and from that moment the main drive started with a machine gun like sound. I put the original TRSDOS disk in and the same thing. I then did some reading and found out that it could be a heat problem. I unplugged the computer and left it for the night. Next morning I attempted to boot the TRSDOS disk–same thing.. rat-a-tat-tat! I am guessing that in the few minutes of play something might have happened to the drive track sensor since I am guessing it is trying to seek track 0. When I start the machine up and the sound comes I end up with the Cass? message. I have only found one video on YouTube that talked about working on the drive but it didn’t go into detail. Are there any local Colorado people on this sub-reddit who can help me bring this back to life? Is there a guide somewhere that will help me diagnose the issue and get it back working? 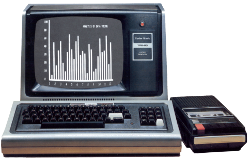 Just a bit of backstory–I was 17 when I first starting playing with a TRS-80 Model I and then III/IV. I played with it at a radio shack–that is how I spent my teenage years hanging in the radio shack learning to program. I was famous in the Tidewater VA area for this and I ended up selling many computers indirectly due to me being a kid showing people about the computer. Anyway–my family never could afford one. Now it is many years later and I am 54 and I couldn’t resist… so here I am. Can you help? I have an issue with TRS-80 model 4 I picked up recently. If the top containing the monitor is pulled off the the monitor will display “diskette?” If it’s left on the display never comes on I’m assuming it’s a short somewhere in the monitor assembly. Any ideas? I just inherited practically an entire Radio Shack store of Computers,Monitors and Software. I need help in fixing a few of the monitors and diagnosing some of the computers that are bad. I have a Model 4 “Gate Array” with the astec power supply. I think this power supply is unreliable as sometimes the machine will not power on. I would like to replace it with a Mean Well model RT-65B. Does anyone have any experience or suggestions with this?